The Royal Academy of Arts presents America after the Fall: Painting in the 1930s, an exhibition that chronicles how artists responded to the social, economic and political turmoil that dominated the decade following the Wall Street Crash of 1929. 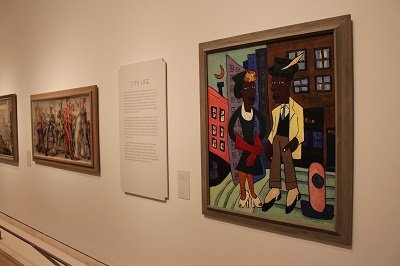 The exhibition draws on paintings from collections across the USA, and showcases forty-five seminal paintings by some of the foremost artists of the era. 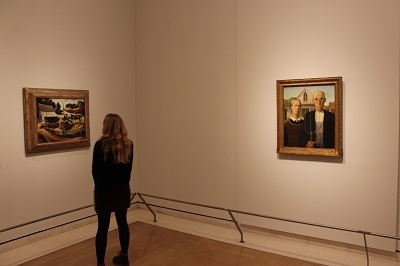 For the very first time, Grant Wood’s iconic painting American Gothic, 1930 will be exhibited outside North America. 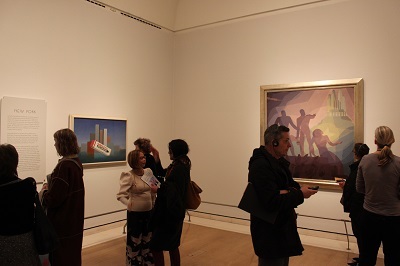 The exhibition will also feature works by Thomas Hart Benton, Georgia O’Keefe, Philip Guston, Edward Hopper, Alice Neel and Jackson Pollock. The Great Depression of the 1930s created considerable economic insecurity and social hardship and artists were keen to chronicle the enormous changes taking place in America. 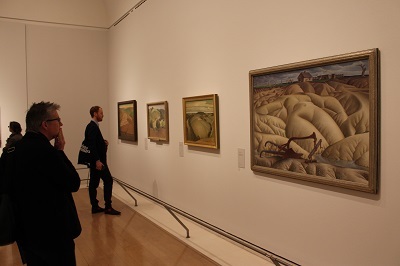 The exhibition provides evidence of the diversity of art created in the period which included a variety of styles. 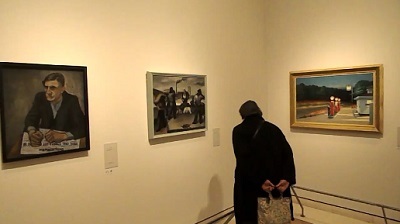 America after the Fall: Painting in the 1930s is arranged around a number of themes sections. 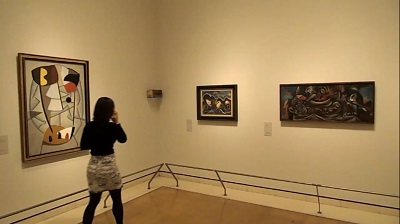 New York offers a number of views in a modernist style including Stuart Davis’ New York-Paris No 3, 1931. Industrial Life illustrates how the enormous growth in industrial manufacturing had raised a number of issues especially concerning labour. Urban Life captures the excitement and dynamism of the city and mass entertainment. Some artists began to question the capitalistic system and the Looking to the Past reveals how artists looked back at American history for inspiration. Other artists like Thomas Hart Benton began to document and idealise the rapidly disappearing rural America. Visions of Dystopia considers how some artists began to consider that American society was falling apart and Looking to the Future presents work by artists such as Arthur Dove and Jackson Pollock, who began to create abstract paintings that turned its back on the dominant figurative movement. 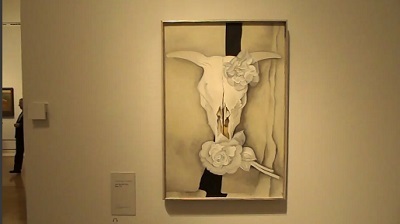 Some of the highlights of the exhibition include Georgia O’Keeffe, Cow’s Skull with Calico Roses, 1931 (Art Institute of Chicago), Charles Sheeler, American Landscape, 1930 (Museum of Modern Art, New York), Jackson Pollock, Untitled, c. 1938-41 (Art Institute of Chicago), Philip Guston, Bombardment, 1937 (Philadelphia Museum of Art), Edward Hopper, Gas, 1940 (Museum of Modern Art , New York), Alice Neel, Pat Whalen, 1935 (Whitney Museum of American Art, New York) and Thomas Hart Benton, Cotton Pickers, 1945 (Private Collection). It seems a very appropriate time to assess America’s response to crisis, the present day and the 1930s have some distinct parallels. In both cases, there is a questioning of what is the American identity and this fascinating exhibition provides a variety of artistic responses. It is somewhat paradoxical that there is often more creativity and experimentation in times of crisis and the exhibition offers plenty of opportunities to consider how art can often be used as prism to consider wider issues. By londonvisitors2014 in Exhibitions on February 21, 2017 .